The true people of God will humble themselves. 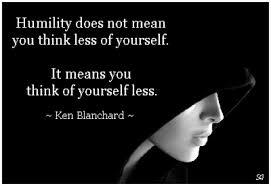 In this age of self-assertive, nobody’s-gonna-put-me-down, narcissistic, self-esteem-enhancing, positive-declaring, beat-down-all-shame, get-rid-of-guilt mentality, we are to find those who can willingly humble themselves? But, I am not a pessimist. I am a believer, and a follower of the Lord Jesus Christ. I do not intend to convey that I have this one all figured out, but I do think it should be fairly obvious to even the casual observer that being self-assertive is the polar opposite to denying oneself. I simply cannot see how the two can possibly go hand in hand. Humbling oneself is the exact same thing. There is no way one can be “loud and proud,” and at the same time be humble. Or, as in this particular verse (2 Chron. 7:14), to purposefully humble themselves. According to the same source, the word ‘humble’ is a derivative of the word 'humus,' which means earth. Therefore, we are left with an apparent conundrum. How can we respond to the ‘new gospel’ of self-esteem while at the same time meeting the requirement of humbling ourselves? May I be so bold as to say we can’t? Such is simply not possible. One or the other of these two principles has to go. They cannot co-habit. Allow me to suggest that one is a concept, while the other is a precept. A concept can be shaped into whatever form suits you (whether it works or not). “Love your neighbor as yourself” (Matt. 22:39) is a precept. It is a command. It is non-negotiable. It is something we are to do. “You must first learn to love yourself before you can love your neighbor” is a concept. It is a man-made derivative of a self-centered mind trying to apply the precept. “If any man will come after me, let him deny himself, …” (Luke 9:23) is a precept. Don’t do it, and you are not following the Lord. “Deny yourself candy for the forty days of Lent” is a concept. It is a man-made idea of how to apply self-denial. “God is a good Father, and won’t let anything bad happen to His children” is a concept conjured up by those who would “make merchandise of you” (2 Pet. 2:3). Therefore, to answer the question of how we can possibly reconcile self-assertiveness with humility, we should be able to recognize which one is the concept and which is the precept. The precept is non-negotiable and comes from God. The concept is something with which we can play and make it into whatever we want. Enhancing our self-esteem is a concept. Nothing in the Bible indicates otherwise. Humbling ourselves is a precept. The true people of God are those who are willing to lay down their efforts to protect their self-image and follow Him wherever the road may take them. I am quite confident that there are many ‘true people of God’ who have bought the lie of the self-esteem gospel. This does not mean they cannot fulfill the requirement given in our verse under discussion. They just have a long way to go to ‘get low’. Let’s each find the place in our hearts where we are standing “loud and proud” and begin to move away from that to a low place of humility before God.